Designed to hold twelve of your signature, fresh cupcakes, these inserts conveniently separate and protect your baked goods during merchandising and transport! Ideal for special orders and trendy cupcake shops, each insert is made from clay-coated kraft paperboard, making it both recyclable and compostable. Plus, it can be used on either the white or kraft side to match your bakery box for a clean, professional presentation.These inserts fit snugly in bakery boxes, and ensure your decorated, sprinkled masterpieces make it home in pristine condition with your patrons. Love these inserts, easy to assemble you don't have to pop out all the holes, they work great in a 10x14 box or a half sheet to hold 24. These are wonderful! They work extremely well with the 1/4 sheet cake boxes for cupcakes. I have also used them with cupcake liners and stored my decorated strawberries in them! These are great for transporting cupcakes...keeps them from touching each other so the frosting and/or decorations stay in tact. Only thing I would change is the height. They keep the cupcakes in place with no movement. Very nice! I love that they are reversible as I like the brown color. They fit very well into the correct size box. Just make sure that you fold the creases properly so that they sit correctly on the box and it doesn’t ruin your cupcakes. These inserts work well and allow you to pick up the cupcake without getting frosting all over your hand. Like the other paper products, although the price is good the shipping costs make them more expensive. these inserts are a god send, they kept my cupcakes from falling or getting mixed colors from others and they are in expensive, i have only used one, because I was able to re-use it various times. We use this insert inside 14x10x4 cupcakes boxes, and it fits perfectly. The inserts can be used on both sides: white or the kraft side. These are perfect to keep the cupcakes in place when transporting from one location to another. It's also great for presentation. I would definitely recommend. Love these guys. They fit perfectly into any 14 x 10 baking box. The assemble easily, if you could really even call it assembly. They hold your average sized cupcakes perfectly so they don't shift or anything during delivery. A+ product. These work great in a 1/4 sheet cake box. Cupcakes do not slide around in box. I would definitely recommend them. Durable cardboard Inserts fits a standard cupcake. They fit in the corresponding box easily! I’ve had a couple of instances of it being a little tall for the cupcakes, but ultimately I’m unconcerned. I have been using these cupcake inserts for about 2 years, so I really like them! They fit great in my boxes. The are easy to assemble and sturdy, They are a great size for most standard cupcakes, but I have two recipes that bake slightly shorter and these are almost to tall for those cupcakes. Great price to quality ratio! I decided to buy these in an effort to move away from the noisy plastic containers. These do the job of keeping your cupcakes in place and nicely separated. My only complaint is that a few times the movement in transporting the cupcakes caused the insert to damage the frosting. However one of the previous reviews said to fold the horizontal lift upward and the vertical ones downward and this solved the problem. The insert no longer has that swell in the middle and everything stays in place. These are a great quality cupcake insert, and they fit well in my boxes. The only downfall is that with certain flavor cupcakes, that dont rise as tall as others, these are a little bit too tall. these inserts fit perfectly into the quarter sheet boxes I purchased from here. the cupcakes stay in place during travel and the inserts are easy to use. not flimsy like those i have purchased elsewhere. These fit perfectly in the 14x10x4" boxes. My favorite part is that you don't have to push down all the tabs within each cupcake circle, like you do with others. Ordered these along with the quarter sheet cake bakery box and they fit perfectly! You can use either the white side or the tan side and both look great. Will be re-ordering. These are a lifesaver. I don't like to use plastic containers any more as I'm trying to be more green. These keep the cupcakes in place and they don't get squished like they would in plastic containers. These are perfect for cupcakes that have elaborate decor or tall frostings. That fit perfectly in a standard sheet cake box and hold the cupcakes nicely! So much more economical to buy these in bulk! This fits perfectly into the Bakery Box (14” x 10”). They aren’t super flimsy and get the job done. Item is exactly what I expected, but proved so much better than the craft je hobby stores. I'll definitely be purchasing these again from this site. These work out great ! my customers love them with their quarter sheet boxes. They prefer these inserts in a box better than the dozen clear cupcake holders because they say it gives it more of a home made look ! These are great must have when using the white bakery boxes!!! They keep the cupcakes secure and even;y apart so not to ruin any decoration. Absolutely love them! They are perfect and hold my cupcakes right in place!! I love that you can flip them too so if you want the white to show or the brown, because I have brown and white boxes. Great product! Super easy to use and keep my cupcakes upright. Impossible to keep them from shifting around and getting messed up in the box without these to hold them in place. I love these! Often times I have cupcakes with more than one layer of icing, or have lots of decorations or embellishments to go on top and the standard plastic deep dome cupcake holders aren't deep enough. Using these inserts inside of a 9x13" cake box provides enough depth so the cupcakes do not get damaged. It holds them in place very well too. This 12 cupcake capacity cupcake box holder is amazing. It fits nicely into a 14 by 10 by 4 inch bakery box. This will hold your cupcakes securely in place inside the box. This make your cupcake presentation and transport really good. This is the best brand for cupcake inserts! I’ve tried other places and this is the best product/price. These are sturdy, nice quality and don’t have a odor as other brands have! These cupcake inserts are awesome. They fit 12 standard sized cupcakes perfectly, and make it so much easier to transport and to get them out. They make the finished product look professional, and take away the risk of cupcakes toppling over. This is beyond my expectation from an insert. It is very sturdy and fits perfectly inside the box that keep the cupcakes in place. I highly recommend! These hold the cupcakes in place perfectly! Fit into my bakery boxes just right for a very professional and pretty presentation. I will order again! Never had a problem with these. Easy to get the cu0cakes in and out, fit perfecrly in a quarter sheet or doubles in a half sheet box. Love these cupcake holders. They fit perfect in the 14x10 boxes I got. My standard size cupcakes fit perfect in the slots. I will keep these in stock always. OMG. These cupcake inserts are exactly what I needed to add to the presentation for my cupcakes. I will definitely order more in the new future. These are the perfect fit for my cakes and make a much nicer presentation for you customers and their cupcake orders. Keeps the cupcakes from shifting! What a great and inexpensive way to hold your cupcakes in the boxes. These work well to hold them with ease and in a cost effective way. These cupcake holders work great. My only issue is they should be made to fit into a half sheet box so you can easily transport 24 cupcakes. I did find that the pink boxes are slightly larger and if I cut the one side support away and cut a little niche in the corner I can slide the second insert into it. I then wrap a piece of clear tape at the front, end and middle to make sure it stays in place. These cupcake inserts are so easy to use! They make displaying cupcakes and muffins easy and are quite affordable, too. I like to use them with the clear window boxes to really let the products shine. These make transporting cupcakes so much easier. They are very easy to use- simply fold the side down and insert into your box. I have use them on both sides, and they function properly either way. I'm so glad I took a chance and ordered these cupcake holders! I have been thinking about it correct and finally took the chance. They are perfect! You can get your fingers in and pick the cupcake up no problem! These are awesome cupcake inserts, beautifully holds a dozen cupcakes in a quarter sheet box. The openings also make decorated cupcakes easy to remove. No reason to ever look further for my cupcakes packaging needs. The cupcake inserts worked great with holding my cupcakes in place while traveling. If you use boxes for your cupcakes, I recommend using the inserts for extra support. These Worked Perfect for cupcakes, they are not flimsy like others i have tried ! I will be repurchasing them in bigger bulk next time ! My cupcakes fit perfectly into the inserts, no touching, no smushed buttercream and you can easily pick up the cupcakes for serving. Easy to set up and fits great in a quarter sheet box(14x10). This product is the best. I had been looking for a way to transport cupcakes to parties and work. These work perfectly and they fit perfectly in the box. These are sturdy and hold standard sized cupcakes perfectly! I love them! I use them with the 14"x10" boxes. They fold nicely and are easy to fit in the boxes. Perfect for holding cupcakes while being decorated. Strong and durable and holds up well during transportation. Cutouts make removing cupcakes simple and without damage to the product. These cupcake inserts work just as described, they pair nicely with the 10x14" boxes and do a great job holding the cupcakes in place so no worries about rolling cupcakes. These are so easy to put together. It just takes a few seconds to refold along the dotted lines and voila! Perfect for holding your cupcakes in place. These work great 1/4 sheet boxes. The only pro alarm I have with them is sometimes they're a little tall for my cupcakes and want to dig into the icing. Good price and good material. Very easy to use and assemble. Sits perfectly inside the cupcake box that I bought with. I will definitely buy again once I finish this case. I just love these cupcake inserts. They are perfect for securing a dozen cupcakes for a professional presentation. Also a perfect for the 10 x 14 boxes. These cupcake dividers are exactly what I was looking for. They keep my cupcakes upright and make for a beautiful presentation! I use these with the pink boxes. I love that they accommodate regulag cup cakes and even the taller ones I make with jumbo wrappers. Great purchase! Great accompanying insert for the Kraft Cake and Bakery Box!! I found that this product is reversible, and since I had purchased the Kraft colored accompanying box, I decided to use the underside of this product which is also Kraft in color. Worked great. Keeps the cupcakes tightly secured for transport, arriving in perfect condition. Great price and well worth the investment. We have bought these many times, it's a great product for packaging cupcakes and for special order cupcakes. We sometime secure the insert with a bit of tape, to make sure it doesn't bounce up with movement. They're pretty good and sturdy inserts for cupcake boxes. The only problem is with one cupcake we bake, which is a gluten-free/vegan cupcake that doesn't rise as much. The holder is a little too high for smaller cupcakes and can take the icing off the cupcakes if the box is shifted. This serves its purpose at a reasonable price. I'm very happy with this purchase and will probably buy again for packaging my cupcakes. No complaints. love. love, love this cupcakes insert! makes my cupcakes look professional it fits a regular sized cupcake and muffin. Pulling out and placing the cupcake is also easy and manageable. Also, you can use the either use the white or brown side of the insert. Easy to insert and remove if needed. Perfect for our big orders to keep the cupcakes, mini pies, or mini cheesecakes upright and not falling over! These two have been great with the boxes when people order cupcakes to go as well as muffins! It makes the product look better when the customer opens the box! This insert fits in a 10"x14" box exactly. Be sure to push it almost completely to the bottom of the box - I left about 1/2inch of space underneath - or the edges of the cupcake (or icing) could come off and the 'base' fall through. The holes are intended for standard-sized cupcakes, and even then if the top flares out too much, the finger holes will be obscured. That said, two boxes of cupcakes made it through a car ride unscathed. Worth the money and finicky nature of the holes. These inserts are a life saver, i added them to my Southeren Campaion 19x14x4 boxes to keep my cupcakes neat and clean when packaging . They are also great for smaller kid cupcakes and makes it so much easier to pull out cupcakes when the over frosting for presentation. I love these inserts! They fit perfect in other store bought boxes that I have to purchase if I run out of my regular boxes. These are the best cupcake holders. They are not flimsy and they hold them secure. I do not have to worry about them tipping over. Easy to assemble and always fit perfectly in the boxes. Love the finished product and feel like my cupcakes will always make it safely to their destination. Would recommend. These cupcake inserts fit my 1/4 sheet boxes perfectly and securely hold my cupcakes in place. They are well made and durable. I highly recommend them. These are nice inserts to hold a dozen standard size cupcakes. They have a slightly higher profile than I would prefer, but still haven't had any problems with them. very sturdy inserts, i would recommend to any looking to hold 12 cupcakes. I did purchase just the inserts thinking two would fit in a bigger sheet box i was wrong. so i inserted one insert and lined the other cupcakes on the size because i often make 2 dozen orders with 2 extra on the side for just in case purposes. but i do recommend these inserts nice and sturdy. I love these cupcake inserts! they are perfect for my cupcake orders, i order the 14" x 10" boxes to go with them. will be ordering them again! Needed cupcake inserts for cupcake orders. Found these at a great price, I don't always get cupcake orders so I didn't want to spend too much when purchasing some.. I'm glad Webstaurant offer them at such a great price.. 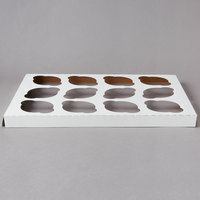 The Cupcake Insert - Standard - Holds 12 Cupcakes - 200 / Case are must haves in the baking industry. Transporting your cupcakes and muffins are a breeze with this insert! These Cupcake Inserts are great! I run a custom Cottage (home based) bakery, and these inserts paired with a 10" x 14" box help visually separate me from the competition at delivery / pick up. They are much more professional looking than a plastic container in my opinion. I have used smaller standard sized cupcakes (Wilton liners) and also the larger 2" x 1.5" liners with these inserts, and I haven't had an issue with either size cupcake shifting or coming out of its space. I use these for all my cupcake orders. We love these inserts for sending out all our cupcake orders. They fit perfectly inside of a quarter sheet box and are strong and sturdy. The cupcake inserts are perfect for holding cupcakes in place while transporting. They have finger holes on the sides that make it so easy to remove the cupcakes without messing up or smudging the design. I will you these for all my packaged cupcakes! These cupcake inserts work great and suit my needs nicely, They hold the cupcakes securely in place and far enough apart from another. Great product. Bought these to go with the 14x10 kraft box. They Fit perfectly inside the box and keeps my cupcakes from tipping over during transport. Will be ordering these again when i run out! The Cupcake Insert - Standard - Holds 12 Cupcakes - 10 / Pack is just what I need to supply all of the local bakeries. I use these cupcake inserts in the 14" x 10" x 4" boxes that I also ordered from this site. They do a fantastic job of holding the cupcakes in place during transit. Just make sure you hold the box from the bottom (or use a cake board) to make sure the bottom doesn't sag, otherwise the cupcakes slip down and the insert can no longer serve its purpose. These cupcake liners work like a charm! They hold the cupcakes securely in place and are MUCH faster and easier to put into the boxes than other styles I've purchased in the past. These are great for cupcakes but make sure you have all `12 cupcakes in the holders and no less otherwise it becomes less sturdy but gets the job done! Works great. Fits perfectly in a 10 x 14" bakery box. Would be even better if they had one with post consumer recycled paper content. These cupcake inserts hold your cupcake securely but still allows for them to be easily removed. Cupcakes sit far enough apart that the icing doesn't smash the cupcake next to it. We use these liners with the white cake box. They work great, we've never had a cupcake slip out of place. They store flat to take up very little space. These inserts are a good price and fit regular sized cupcakes and 10x14 boxes so well. I use the kraft side for my cupcakes. I couldn't imagine having to package them without inserts. Great Price! Great product! The shipping is always timely and the product is very secure and prevents the cupcakes from tipping over. Great investment for cupcake business that bakes standard sized cupcakes. Fits perfectly inside a 14x9 (1/4 sheet) box, snug so cupcakes don't move around. One side is white and the other is Craft brown to you can match as you please. Works well to hold our cupcakes in place in the box. We don't do many cupcake orders, but when we do they are handy to have!! GREAT INSERTS.. Every cupcake stays put - big or small. I have never had any accidents and all of my products have traveled well with these inserts. No complaints from clients either! Oh I love theses. They work perfectly with the 14" x 10" x 4" Pink Cake / Bakery Box - 100. What a great way to transport cupcakes and not have to worry about getting your container back. Perfect for school treats, I use them all the time. Totally worth the money, they are a great price if bought here! These cupcake inserts do a great job of holding cupcakes in place in a 10" x 14" box. They fit snugly and do not move around. Made of sturdy cardboard. I did a lot of price comparison on many different websites and ended up going with webstaurantstore.com. The boxes and cupcake inserts are perfect for my hobby baking business! The right fit and decent quality at a great price. Great insert - we use it for our gourmet cupcakes and put it in the larger 14x10 box. Arrives in the package nicely and comes out easily. I love these inserts...! They allow me to place cupcakes for transport and not have to worry if they will fall over... Amazingly sturdy and strong... Also I can write on the cardboard material to the fillings I put in if I forget... I would recommend to anyone who loves cupcakes... So useful...! Perfect cupcake inserts for the 14"x10x4" bakery boxes. They're sturdy and keep the cupcakes in place during transport. Would definitely buy again. Great website and product. These inserts work great with the quarter sheet boxes and boards also available from webstaurant. Your cupcakes will never fall again. For a neater finished look make sure you decorate the cupcakes in the box! These inserts work well in a bakery box, however I got the impression before I bought them that they would fit two in a half sheet box. They don't (see photo). I wish Webstaurant sold a bigger size to fit the half sheet box. This are PERFECT for the 10" x 14" cupcake boxes sold here. They had great dual sides, so you can choose between white finish or kraft finish. We love love love these holders!!!! These are perfect for my cake boxes to sell a dozen cupcakes. I bought too many boxes and not enough liners. These fit great. Than you. This cupcake insert fits perfectly into the quarter sheet cake box. This ensures my cupcakes don't get ruined on the delivery. There are spaces to place your fingers in order to get the cupcake out without touching the icing. These inserts are great used in the 14 x 10 x4 inch Kraft Quart Sheet Cake boxes. I just flip them over to match the cake box. Fits the 14" x 10" x 4" kraft quarter sheet cake box perfectly. The insert is reversible and is craft brown on teh other side. I love the craft brown color! These are nice to keep your cupcakes in place when travelling. We use them for storing our cupcakes so they don't fall over, or smoosh together! I have used cheaper quality inserts in my day that frankly don't hold up. These inserts are stiff and well made and just get the job done! All products that I have purchased for my cake business have been quality that I have come to rely on and appreciate. These are the perfect inserts for a 1/4 sheet box and they give hobby bakers & professional bakers a professional looking presentation upon delivery of their cupcakes. I like the 10 pack option. I love these little holders. The cupcakes fit snug and secure. I use the cupcake inserts with the cake box i purchased on this site. Great buy!! Cupcake inserts are extremely easy to use and are spaced perfectly. Cupcakes truly shine in box. Inserts come in a flat piece and you bend 4 sides and insert into applicable box. User friendly. I use these inserts to hold one dozen cupcakes. They hold the cupcakes in place so they don't roll around in the box during transport. Came exactly as pictured and is very easy to assemble and insert. Ordered it with 10 x 14 x 4 Kraft Bakery Box for my cupcake dozens, works great. Love these 12 cup cupcake holders, I can't sell cupcakes without them they hold in place and ensure to tipping. \ Will def keep ordering.. its a must!! These cupcake insets securely hold our cupcakes during dleiveries and transport. They fit in the accompanying box perfectly. The price is the best I have found anywhere. These are great. Fit perfectly in the 14"x10"x4" boxes and leave plenty of height for decorated cupcakes. So glad I found these inserts, great product and price! Bought the 10 pack just to see if really necessary, will definately buy again. Makes cupcake and or muffin transport very easy. Will buy again! These standard sized cupcake inserts have made packaging various size orders of cupcakes a breeze! Try them, you'll like them and so will your customers! These hold your cupcakes without a doubt! It would be nice if not 90% of them had a tear on them.. it makes us look like we broke them and doesn't give a great presentation! I've used other inserts purchased from elsewhere that either ruin the cupcake icing or are large so the cupcake shifts around, Best price anywhere for these! get rid of your supplier and order them from webstaurantstore!!! Love having these for my cupcake orders. I'm a small shop, so these really help keep things looking professional. They are nice and sturdy as well. These are good sturdy inserts. Unfortunately, most of the industry doesn't make tall enough cupcake liners to accommodate the regular height of these inserts, so I cut them down a little bit. That keeps the cupcake frosting from being destroyed if we, say, hit a bump in the road while taking the cakes somewhere. But if you had taller liners, the height of these inserts is perfect! These inserts fit in my boxes perfectly and hold the cupcakes securely so they don't move and tumble when delivering them. Being able to use them in windowless or windowed boxes depending on the venue is great! Best price anywhere for these! Fits perfectly in a 1/4 sheet box, simple to use, stores with minimal space and has finger slots for removing cupcakes simply. These inserts are perfect for keeping cupcakes in their place and fit perfectly in a quarter sheet cake box or you can put two in a half sheet cake box! These are awesome, I bought them with the pink half sheet boxes and they keep all of my cupcakes right where they need to be during transport. Just be sure to fold them correctly or they won't stand up all the way. This cupcake insert was perfect. It fit perfectly inside my 10x14 bakery box and held my muffins just right. The little spaces on each side make it very easy to get the product in and out! And it looks so much better than handing out muffins in zip lock bags. I've ordered this style of insert several times from another vendor at twice the price! These came nicely packaged and securely delivered via Fed Ex. Great product! These go along great with my beautiful boxes. They don't collapse and I don't have to put tape on them like other inserts I have purchased. These inserts are sturdy, easy to fold, and slip right into our cupcake boxes. They keep our cupcakes safe and in place during transport, ensuring that they arrive looking just as great as when then left the bakery. We just wish they sat a little lower in the box because we have had a couple of cupcakes slip under the insert. This standard 12 cupcake holder is perfectly priced. It is reversible, which allows for more than one use if you only need it for transport purposes. The "grab" holes on either side of the cupcake slots make it easy to pick up your cupcakes. This cupcake insert displays my cupcakes very well. It keeps the cupcakes seperated and easy to remove. There is no danger of cupcakes touching each other or moving around. Smaller cupcakes can fit by leaving two of the flaps up or down. My smaller cupcakes fit by folding the vertical flaps up and folding the horizontal flaps down. These cupcake inserts are great quality and sturdy. They don't shift or move and are not flimsy. They fit the standard size cupcake very well. I've used other inserts purchased from elsewhere that either ruin the cupcake icing or are large so the cupcake shifts around, but not this one. These inserts hold the cupcakes in place very well. Very pleased!! These inserts are sturdy and perfect for displaying and packaging treats without damaging them. The finger holds make it easy and convenient to grab cupcakes. Love these little inserts for my cupcakes! They display my cupcakes beautifully and keep them from sliding all round in the box. Holds a dozen. I love these! I have found that the clear plastic cupcake containers, although cute, are too small for cupcakes that are fully rounded or have toppers on them. They tend to get smashed together, or the lid smashes toppers into the frosting. With these, placed in the 1/4 sheet box, the cupcakes have more room around them, keeping the separate, and the toppers fit without being smashed into the frosting. These are fantastic!!! Keep the cupcakes in place and fit perfectly in the box. These holders are great, makes everything so much easier, and a great value! These cupcake inserts do the job! They are sturdy and the insert holes are the perfect size to fit standard size cupcakes. They're economically priced too! Love these liners! They fit perfectly in the boxes and keep the cupcakes safe! They are a great deal! I have not found these cheaper anywhere else! Works great to hold one dozen cupcakes!! Need to fit two dozen?? No problem, trim the holder and it can fit in the 19" x 14" box. These cupcake inserts are perfect for packaging my custom bridal shower cupcakes. I bake cupcakes that are 1.5" high and these do the trick. Also, with a slight alteration, two inserts will fit side by side in a 19x14x14 half sheet box. I can also fit a 1/4 sheet cake and one of these 12 cupcake inserts in the same half sheet box. These inserts fit perfectly in the 10x14 box, and are great to hold 1 dozen cupcakes. The cupcakes stay exactly where you put them, so there's no worrying about messing up your perfect frosting! Tis insert is perfect for my cupcakes. It is just the finishing touch to them. This is a great way to send and display your finishing product. Worth buying! Cupcakes stay put now! Yes, we we're a little reluctant to purchase these as we've been selling the cupcakes loosely in their boxes for quite a while now, but now that we have these inserts we're worry free for transportation of our yummy creations. I love these Inserts. They keep all of my cupcakes nice and neat. I was really sad that they don't fit the boxes I would normally use for two dozen cupcakes. However, I see the pink boxes do and will probably order some. LOVE these inserts! I mistakenly bought the wrong "6 cupcake inserts" (there's 2 different ones for sale on the website so check the dimensions depending on what box you're using) last year thinking I could add two of them into my 10x14x4 bakery boxes. I was wrong. It wasn't a big deal but after awhile I thought it'd be good idea to actually purchase these inserts so that my cupcakes would be presented better. I've had these now for a few months, and I wished I had purchased them sooner. They're great, I'll be purchasing these again in the future! I'm a little on the fence with this. It fits perfectly in 14x10 boxes but you can't fit 2 in a 19x14 box. That was what we primarily intended when purchasing. The quality of the cardboard it good. Ideal for packaging pastry. We buy this item regularly.True to size. I would definitely recommend this product, especially at this great price! I Love these cupcake inserts. They fit into the 1/4 sheet boxes (14' x 10" Boxes). They hold the cupcakes in place and prevent them from shifting during transportation.